Hey y'all! Today, I'm showing you a little DIY painted clutch purse that you can make this holiday season either for yourself to show off at parties and events, or for gifts for your friends and family. 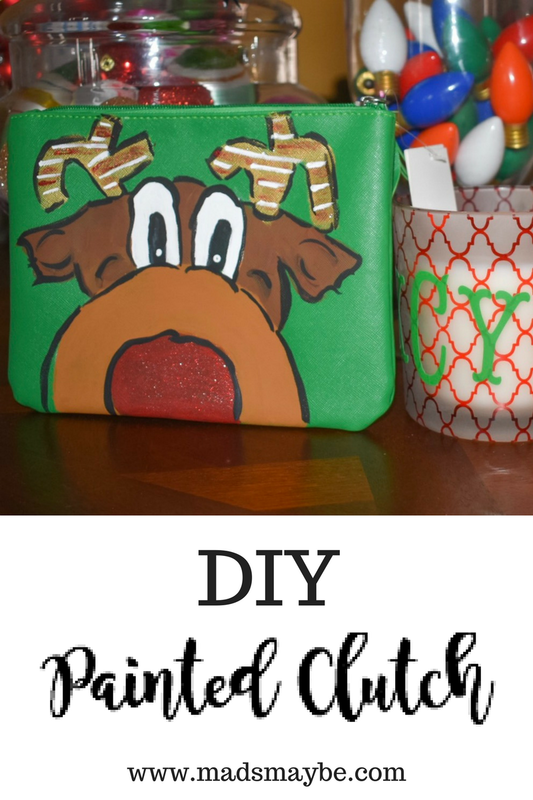 This is such a fun way to personalize a gift that's inexpensive and turn it into something that's really priceless because it's so unique and something that no one else will have. Let's get started with what you'll need! My mom and I found our clutch in the dollar spot at Target. 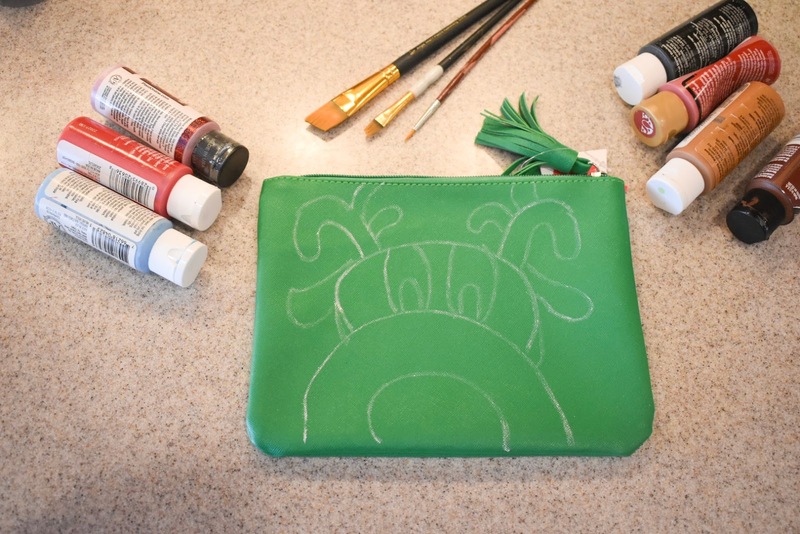 It was less than $5 and the material is kind of a faux leather, which is perfect for painting. Any bag of a similar material and style should work perfectly. 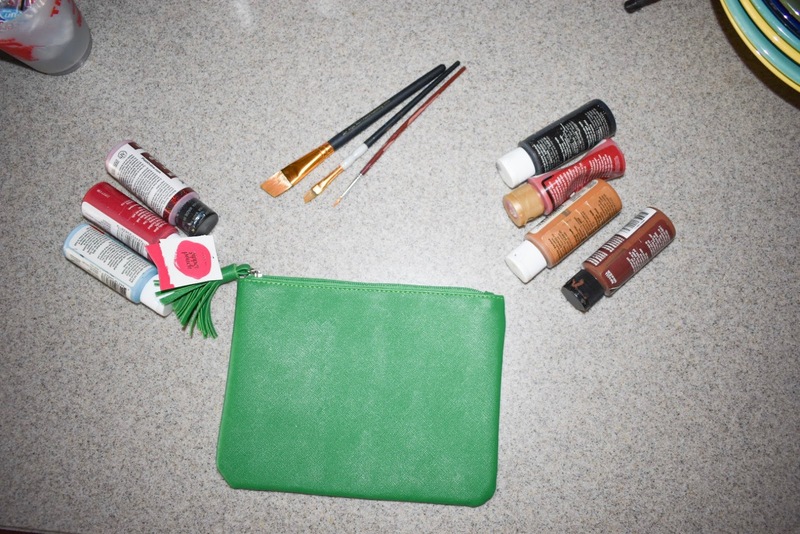 The other things you'll need are chalk, regular paint, and paintbrushes. The first thing I did was outline the image I wanted to paint with chalk on the bag so that I could get an idea of what it would look like using a material that I could easily erase. 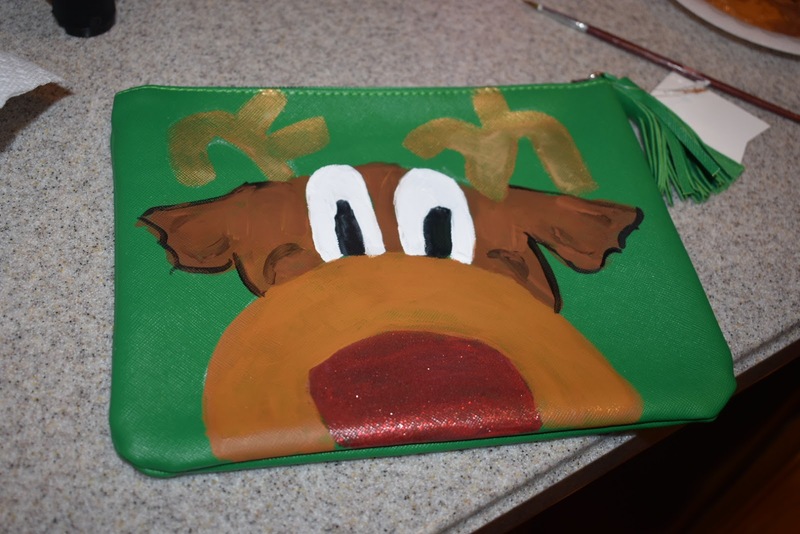 I just did a freehand outline of what I was picturing in my mind as a whimsical reindeer that was expanding off the bag and didn't worry about making the lines perfect. 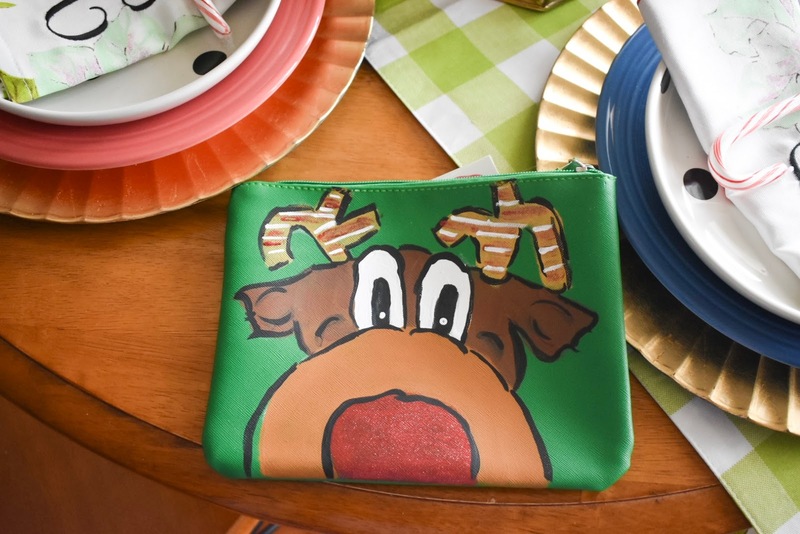 You could do any type of image that you want on your bag - from Santa's face to a Christmas tree, ornaments, holly leaves, a gingerbread house - the possibilities are endless! If you're making gifts, you could definitely experiment with different pictures so that everyone has their own unique style. After I was happy with my outline, my mom and I painted in the lines with regular craft paint. We did several layers and added things to the design as we went along. 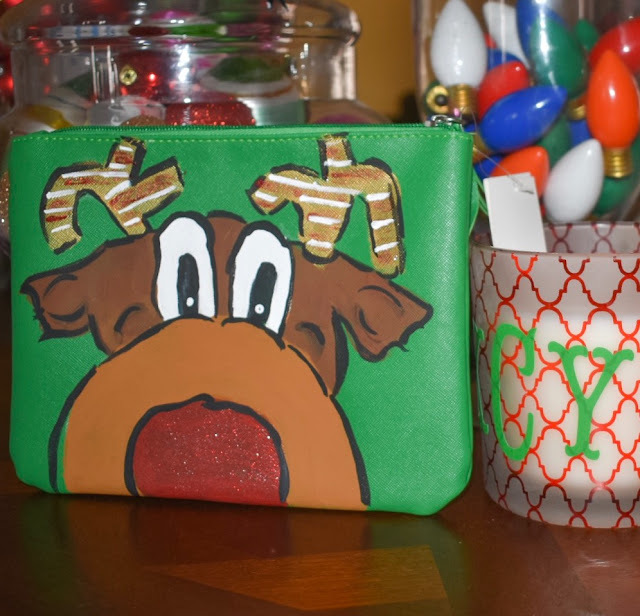 We happened to have a red glitter paint that was perfect for Rudolph's nose! This picture was taken about halfway through the project when everything had a base coat of paint and then we continued to add details and additional layers as needed. We wanted to make our reindeer really cute and whimsical. As you can see, there are plenty of places that aren't perfect at this point. I love that this bag is custom and completely designed by us. It hasn't made its debut out in public yet, but I have a feeling it'll be a great conversation starter. It's multifunctional and would be a fantastic gift for any of the ladies on your list - or Secret Santa and other gift exchanges! Note: You will want to spray your finished product with a clear sealant so the paint isn't as likely to rub off! If you decide to make your own painted clutch, you know I want to see pictures! Tweet me, tag me on Instagram, or post on my Facebook page! 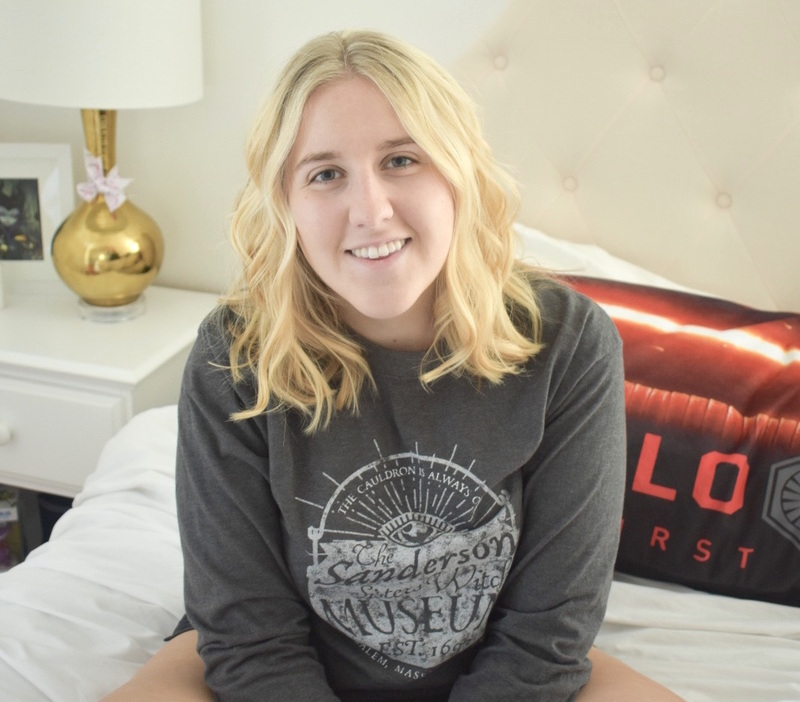 I really really hope you try this DIY because I can't wait to see your designs and hear your thoughts!